Conceptual rendering of California’s High Speed Rail in action. 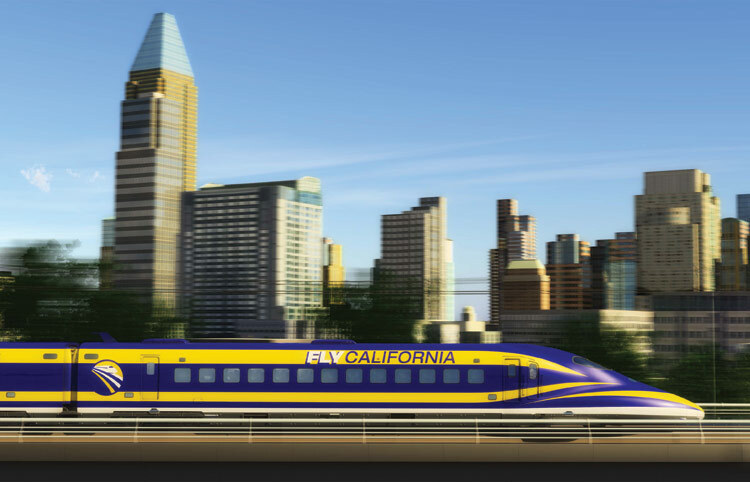 On Friday the California state senate narrowly approved funding for the state’s High Speed Rail (HSR) project, authorizing the start of construction for the effort. Previously, supporters and opponents had been at each others’ throats over costs, environmentalists worryied over habitat disruption, and Congress threatened to cut off much of the endeavor’s federal funds. While any project of this scale deserves scrutiny, we must keep our eyes on the prize: high-speed rail presents a critical opportunity for California, one that will catalyze an economically, socially, and ecologically vital future for the state. The California High-Speed Rail Authority (CHSRA) estimates that the price of expanding the state’s aviation and automobile infrastructure to meet future demand would be nearly twice HSR’s $98 billion price tag. Yet even this revealing figure belies the breadth of HSR’s economic and environmental benefits. If job creation, population growth, economic stagnation, and climate change are the state’s greatest challenges, then HSR offers a compelling answer. Its advantages can reverberate at every scale, benefiting California as well as providing a national model for development that creates robust communities, a healthier environment, and a more resilient, interconnected economy. Existing high-speed rail systems already demonstrate clear ecological advantages. A Eurostar trip between London and Paris generates 49 pounds of carbon dioxide emissions per passenger, compared to 538 pounds per passenger for the equivalent airplane trip. That’s a 90 percent reduction. In California, it’s anticipated that HSR, powered in part by electricity from renewable resources, will reduce carbon emissions by 12 billion pounds per year and save 12.7 million barrels of oil per year as a result of reduced auto and airline trips. Rendering of HOK and Buro Happold’s ARTIC Station in Anaheim. Air travel has other downsides beyond its carbon emissions and vulnerability to rising fuel costs. Airports tend to be located far from urban centers, disconnecting these key transit nodes from a city’s densest areas and making airport transfers a time- and energy-consuming endeavor. In contrast, most of the 24 proposed HSR stations will be located in the hearts of their respective cities, spurring more sustainable and denser infill development and accelerating improvements to municipal rail, bus, and bicycle transportation networks. The integration of HSR, local public transit, and urban density is the crux of HSR’s real value for California. In order to absorb the state’s anticipated population growth of more than 20 million people by 2050, we need a rail system that bolsters efficient regional mass transit with better local public transit and high-density, mixed-use development. A true statewide initiative, the proposed 800-mile system will not only link the state’s key urban centers, such as San Francisco, Sacramento, Los Angeles, Orange County, and San Diego, it will also provide underserved areas such as Fresno, Bakersfield, Palmdale, and Riverside with improved access for commuters, increased opportunities for knowledge sharing and business growth, and revitalization of their commercial cores. Refocusing on our urban centers will invigorate our economy, efficiently moving people, ideas, and services through mixed-use, downtown transit hubs that further promote urban regeneration. Already, high-profile projects such as San Francisco’s Transbay Transit Center, the Anaheim Regional Transportation Intermodal Center, and Los Angeles’s Union Station Master Plan competition all anticipate HSR’s arrival. But Bakersfield, Fresno, and other Central Valley cities also are rethinking their central districts, proposing denser, transit-oriented development that counters the region’s destructive legacy of sprawl. 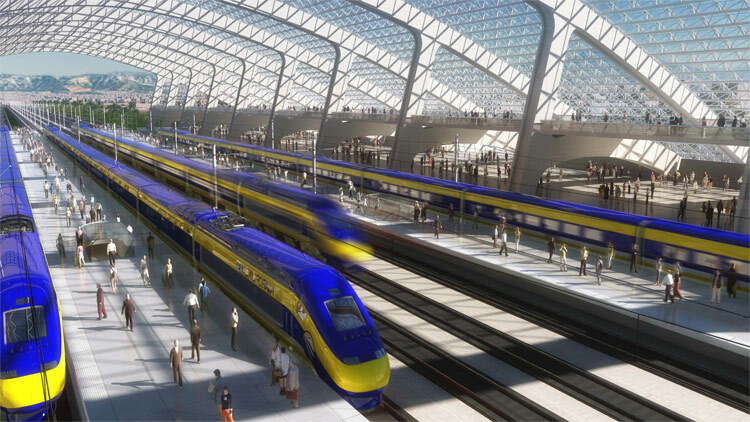 Conceptual rendering of a high speed rail station in California. By making it easier and faster to travel between cities, HSR taps into the broader factors driving our state’s sustainability. Communities become closer, spurring new business and job opportunities that in turn strengthen our social fabric. A more interconnected economy will temper the regional isolation that makes some communities less able to weather economic downturns. Equally important, the compact, transit-centered cities that HSR engenders would get people out of their cars, improving air quality, bettering public health by encouraging walking, and fostering greater connectivity among communities. HSR will create an embedded transportation infrastructure that will serve as a backbone for California’s social, economic, and environmental health and resiliency for decades to come. It’s time to boldly embrace the demonstrated success of high-speed rail systems around the world, and meet the state’s challenges head on. Investing in HSR makes sense at both the regional and local scales. I anticipate the day when I can travel from our Culver City office via light rail to Union Station, jump aboard the high-speed rail to San Francisco, and stroll to our San Francisco office on Grant Avenue, experiencing the inspirational quality of the California landscape and her vibrant cities—all in just over three and a half hours.